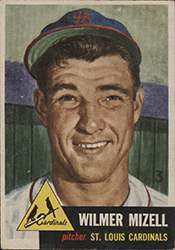 MIZELL, Wilmer David (Vinegar Bend), a Representative from North Carolina; born in Vinegar Bend, Washington County, Ala., August 13, 1930; graduated from high school, Leakesville, Miss., 1949; served in the United States Army, 1953-1954; professional baseball pitcher, 1949-1963; employed by the Pepsi-Cola Co. in sales management and public relations, Winston-Salem, N.C., 1963-1967; elected Davidson County commissioner and later selected as chairman, Board of County Commissioners, 1966; elected as a Republican to the Ninety-first and to the two succeeding Congresses (January 3, 1969-January 3, 1975); unsuccessful candidate for reelection in 1974 to the Ninety-fourth Congress; Assistant Secretary of Commerce for Economic Development, March 1975 to May 1976; unsuccessful candidate for election in 1976 to the Ninety-fifth Congress; Assistant Secretary of Agriculture for Governmental and Public Affairs under President Ronald Reagan; under President George Bush Deputy Assistant Secretary for Intergovernmental Affairs, Department of Veterans Affairs, and executive director of the President's Council on Physical Fitness and Sports; was a resident of Midway, N.C.; died February 21, 1999, in Kerrville, Tex. Ralph Nader Congress Project. Citizens Look at Congress: Wilmer (Vinegar Bend) Mizell, Republican Representative from North Carolina. Washington, D. C.: Grossman Publishers, 1972. U. S. Congress. House. Nomination of Wilmer D. Mizell, Sr.: Hearing Before the Committee, Ninety-Fourth Congress, lst Session, on the Nomination of Wilmer D. Mizell, Sr., to Be Assistant Secretary of Commerce, Feb. 24, 1975. 94th Cong., 1st sess., 1975. Washington: Government Printing Office, 1975.